AliExpress is a Chinese based e-commerce site, that allows you to ship items directly from China to most countries all over the world. AliExpress is a marketplace that has a huge variety of sellers and merchandise. Similar to Amazon, you will find independent sellers that stock their own merchandise in huge warehouses. They sell their products directly to individual buyers. As drop-shippers, we used to be very cautious about sourcing goods from Chinese suppliers. Problems with supplier reliability, quality of the goods, and very long shipping times (4 to over 8 weeks) usually without any tracking info are reasons drop shippers shy away from them. AliExpress realized these problems. Thus started a campaign to get feedback from buyers. These feedback helped them grade their sellers, just like eBay and Amazon. Furthermore, a new shipping method was created called ePacket. This combines faster shipping (7-21 days to the US) and ensures that tracking info is provided. All these factors make AliExpress a viable source for cheaper merchandise. This is a full free webinar that will show you how to work with AliExpress the right way. Working with AliExpress is very different as compared to working with US based suppliers such as Amazon, Walmart, Sears, and others we are familiar with. First thing we have to do is create a new business policy that will fit AliExpress. This is the most important policy. In AliExpress, you will find a variety of sellers that use an assortment of shipping methods. The Shipping Policy expires after 15 days from the date the order process has ended. ePacket is a shipping option offered by merchants in China and Hong Kong. It allows these merchants to provide a fast and affordable shipping option for light packages with tracking info. Our personal recommendation is to work with sellers that use only epacket for shipping to the U.S. ( a relatively fast service 7-21 days from time of shipment). 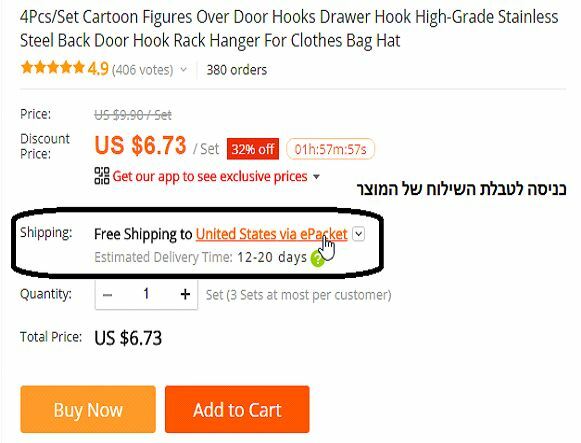 Other popular services to the United States are China Post & AliExpress Standard Shippingwhich take about 19-40 days from the time of shipping. We can see what shipping options the seller offers on their Shipping Table. Here you will see the rates & duration of shipping to various countries. Make sure you choose the right destination country so as to get the exact rate. When you upload an item through DSM Rapid Lister, the shipping rate is calculated automatically. Later in this article, more detailed information on uploading through DSM. 95% of the products from AliExpress will offer free shipping, by one of the methods mentioned, especially inexpensive and small light weight ones. In case of heavy and / or expensive items, the supplier may include the extra cost in the final price, or add an additional charge for shipping. We recommend keeping PayPal Immediate payment policy. 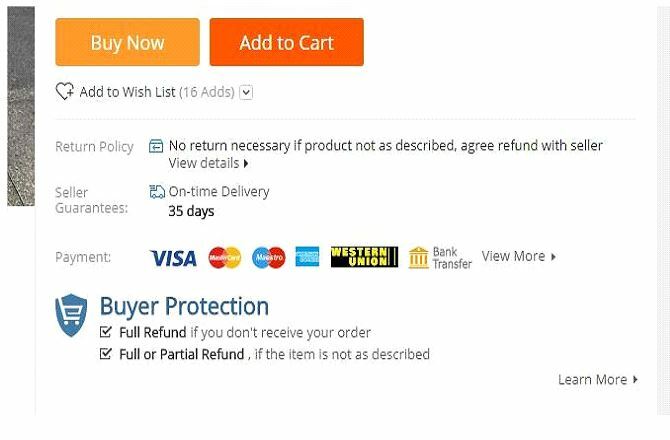 In AliExpress, most items have either a 14 or 30 day return policy. (A 60 day return policy is virtually none existent) on small and inexpensive items. It’s more likely that the buyer might get a partial or full refund while keeping the item. We can find the particular Return Policy just beneath the BUY NOW button in very selling page. What does “the order process has ended.” mean? For every purchase, a “time allotment” will be set depending on the shipping time set for that item at the ordering stage. Calculation of time allowed for return consist of the shipping method, the destination country, and the return policy of that particular seller. Many of the sellers will offer ON TIME DELIEVERY GUARANTEE. In a scenario like this, if the order hasn’t arrived within the guaranteed time we can open a case and get a full refund. Even if the time allotted for opening a case, after the On Time Delivery have expired, we can still get in touch with the seller directly, and they might still issue a refund. DSM allows all the different shipping methods used by AliExpress, that said, the Price Monitor cannot determine which shipping method you choose for each and every item. Therefore if you want the shipping cost to be calculated automatically, you must always use just one shipping method. For example, if you choose using just ePacket, we can set the Monitor to calculate shipping costs for any item shipped by ePacket. And to put any item not shipped by epacket as Out Of Stock. These items will show on DSM with the Orange “lock”. In this scenario only items shipped by ePacket will be offered for sale on your eBay account, and the shipping fees (if there are any) will be added by the Monitor. It is highly recommended that we choose just one shipping method so our shipping policy will coincide with the Shipping Policy on eBay. We highly recommend using the relatively faster shipping methods, either ePacket or China Post. 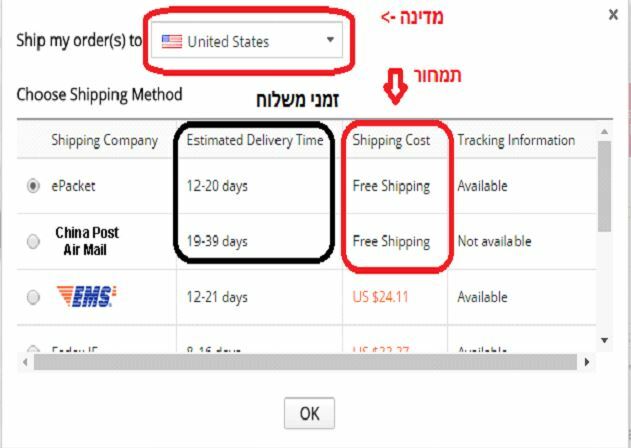 If you prefer to use more than one shipping method, and not have DSM put in Protected Mode (Orange lock), turn off the option in (לא ברור איזו אופציה ) Settings. In this case the shipping fees (if there are any) will not be added to the price of the item, therefore it is recommended listing with Free Shipping, or adding the shipping cost to the cost of the item before listing it. International sellers might be surfing AliExpress in their countries local site. After we set the Business Policy on eBay and on DSM and after we choose the Protection Mode in Monitor Settings, we can start dropshipping from AliExpress to eBay.